This week there are three interesting Rules incidents to report on. 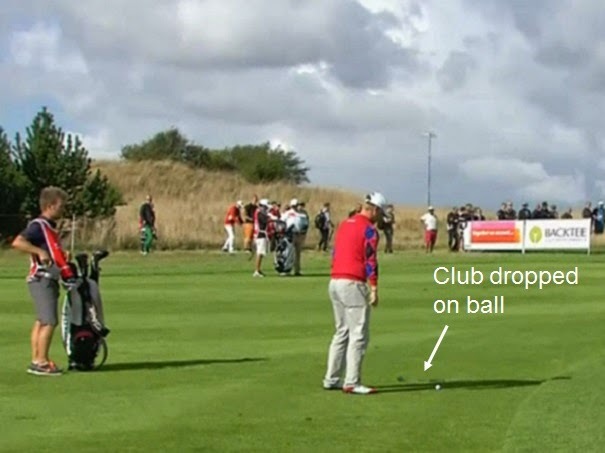 The first concerns Dane, Morten Madsen, who accidentally dropped his club on his ball during the ‘Made in Denmark’ European Tour event on Friday. No mystery about this ruling, the player incurs a penalty of one stroke under Rule 18-2a(ii), for his equipment causing his ball to move, and he has to replace his ball where it was. If you would like to view Madsen’s embarrassing bloomer click on this link. "there could be the slightest doubt that the swing over the ball should have been recorded as a stroke"
The definition of a stroke includes "...with the intention of striking at and moving the ball...". How could there be any doubt? Does he not know what his intention was? He seems uniquely qualified to determine if he intended to strike and move the ball. He should either say he intended to do it and should be a stroke or he should say nothing. In my humble opinion, of course. I agree. I suspect this obfuscation is more to do with an excuse as to why he took so long to admit to the breach. Aha. That makes sense. A few sleepless nights will do that to a guy.